Is there a better alternative to Play Sound? Is Play Sound really the best app in Audio category? Will Play Sound work good on macOS 10.13.4? Play Sound is a simple, no-fuss sound player that supports QuickTime sound files (for example, AIFF or MP3 files), Classic Mac OS System 7 sound files (files with a file type of 'sfil' that contain 'snd ' resources), or any 'snd ' resources embedded into any file. You can play an unlimited number of sounds concurrently or one at a time. You can loop sounds, repeat sounds, play specified portions of sounds, control the volume of sounds played, pause and continue sound play, and press the Escape or Command-Period keys to abort sound play. Play Sound needs a rating. Be the first to rate this app and get the discussion started! To use Play Sound as a simple sound file player, simply drag and drop the sound file(s) onto the Play Sound icon in the Mac OS Finder. Better yet, you can configure the Mac OS X Finder to automatically open sound files with Play Sound whenever you double-click them (see Using Play Sound As a Sound Player in the documentation for easy instructions showing how to do this). 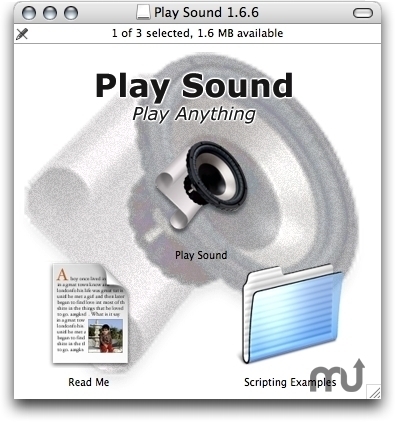 Play Sound is fully scriptable, allowing AppleScript writers to use simple, easy-to-understand English syntax to play most QuickTime-supported sound files, Classic Mac OS System 7 sound files, and even 'snd ' resources that are embedded directly in script applets. To script Play Sound, you call it from any AppleScript script or application.